Obon is an important holiday for Japanese Buddhists to honor the departed spirits of one's ancestors. Or, in my terms, honor those relatives that have died. In my life, Bon Odori (the dance portion of Obon) has been two nights of festivities in July at the Seattle Buddhist Church -- dancing, food, Taiko drumming, and, as an adult, a beer garden. I feel a personal connection to Bon Odori; My (paternal) great grandmother, Fuku Nakatani, was the preeminent instructor of Japenese dance and music in the United States. Decades preceding Japanese American Internment ("Camp") during World War II until her death in 1969, she taught Japanese dance to many young and not-so-young girls, including my mother, in the Seattle area. And, many (I'm guessing most) of the Bon Odori dances that are performed all over the United States were created by her. I don't think many people remember this, so my "connection" is largely anonymous as I wander Main St. during the festivities. It makes me proud, but I've kept this "secret" largely to myself. This weekend is the 75th Anniversary of Bon Odori of the Seattle Buddhist Church. Much to my surprise, the Seattle Times covered this story, featuring my grandmother. The road from San Francisco to Seattle is well traveled. 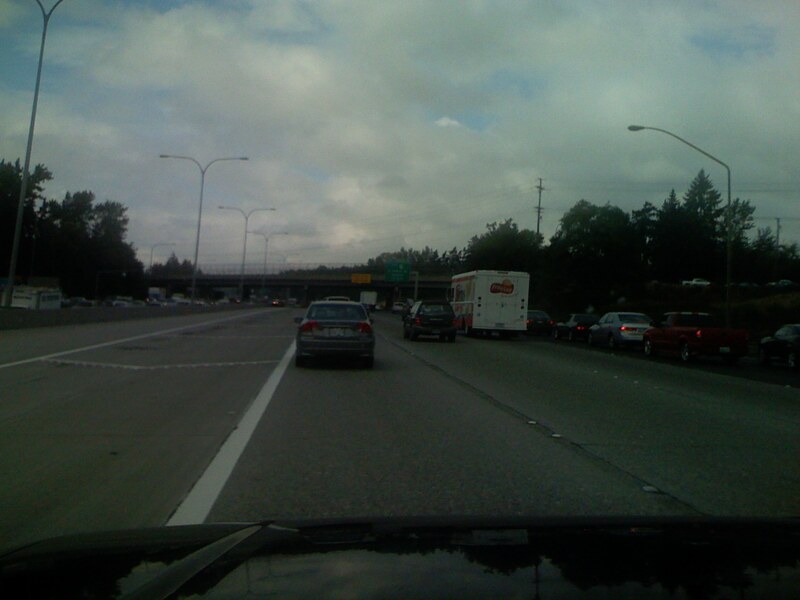 It's largely a straight shot up I5 -- the front end starts with a few minutes on 101 and little time on I80 before taking the I505 short cut to I5. It's about 850 miles. I've done the trip many times. 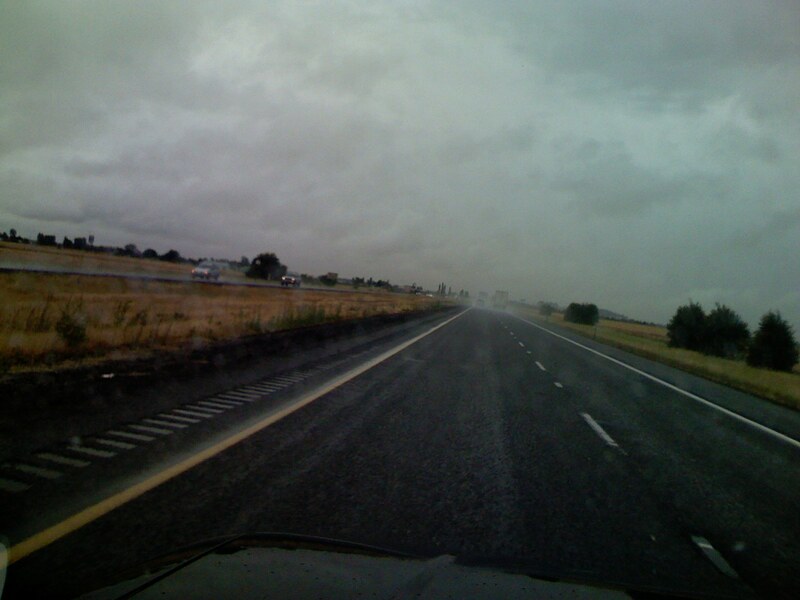 I've just finished my latest journey -- I left on Tuesday afternoon, spent the night in Cottage Grove, OR and arrived for dinner at my parents house on Wednesday. It's a comfortable 2 day (one night) drive, but I've done it all in one long day as well. 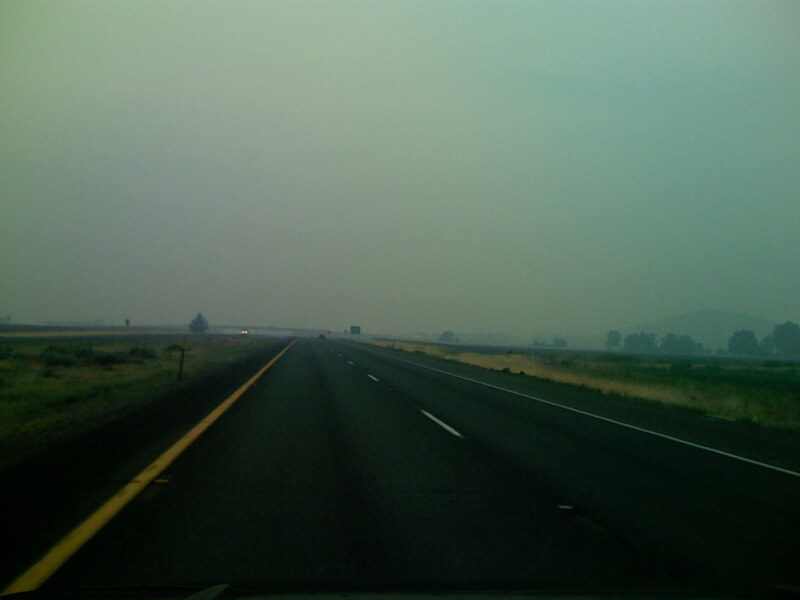 I5 in California , for the most part, doesn't look too different than I5 in Oregon. For that matter it doesn't look too different in Washington either. factors. In the Winter there is snow and ice, so I try to avoid driving at night. When I do a two day trip I always stay somewhere between Grants Pass and Eugene. On the way North, I rationalize that it makes for an easy day two drive. (When traveling from Seattle to San Francisco, I rationalize that it is better to drive the Siskiyous in the morning when I'm more alert and fresh). Seven hours day one and 7 hours day two (with gas and food stops) make for pretty comfortble days..
For the cost conscious, it seems that Eugene is the best for inexpensive hotels -- around $50 with a coupon I pick up at Denny's. The Comfort Inn at Cottage Grove was over $80 this trip. Maybe I can get these merchants to offer MerchantCircle coupons. The small town gas stops are always entertaining. You meet the most interesting people passing through and the "locals" always have a good story or two. We (MerchantCircle) live and die by Google. 90% of our traffic comes from the Big G. One day in November (November 4), we saw a huge uptick in traffic. All from Google. 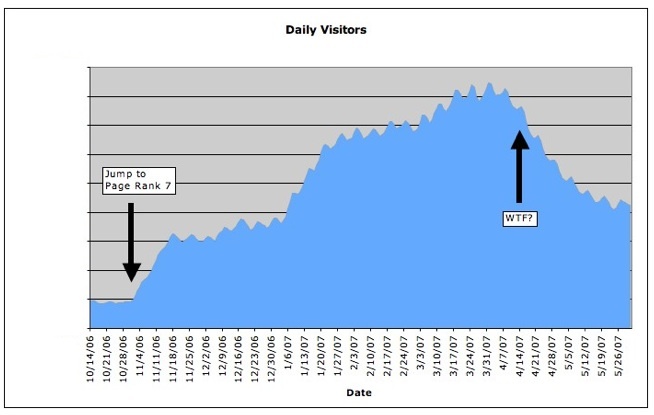 We think we had gone from Page Rank 6 to a Page Rank 7. Didn't realize that we'd take a quantum jump as we crossed that boundary. While surpised, this was obviously Good News. Now, come April 2007. Our traffic tanks. Our SERPs are down. Pages indexed by Google drops from over 2.5MM to less than 1.5MM. Visits from Googlebot become erratic. Visits, page views, and Adsense fall. Ah, to live and die by Google. 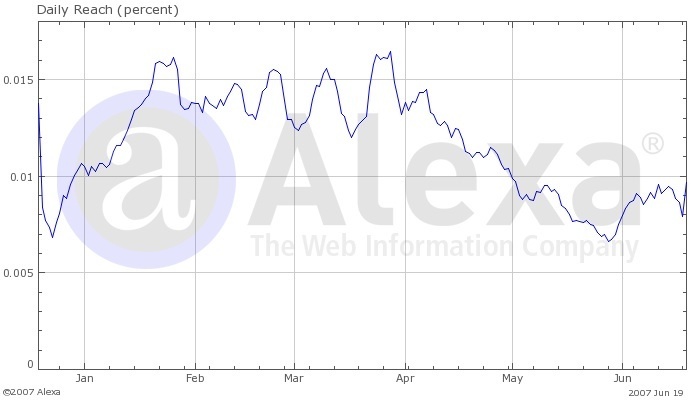 When we started MerchantCircle, we made a bet; Google will be the driver of traffic to our site. We put all of our eggs into the Google basket, as the proverb goes. While this may seem obvious now, this wasn't necessarily clear then. In that bet, we decided to play fairly and transparently. We'd employ only "white hat" tactics to drive traffic and we were in it "for the long haul." We knew our efforts would not be rewarded immediately and we might not be rewarded at all. Further, we based our choices on anectodal knowledge and the collective wisdom of the web -- using Google of course. And, it's been difficult the measure the exact cause-effect relationship between our actions and changes in traffic. We've been moving fast, shipping significant releases at least once a month, with few analytical tools (Google Analytics). A lot has been written about the accuracy of Alexa, so I won't repeat them here. In particular, because our traffic is not concentrated in the hotbeds of where I think the Alexa toolbar is downloaded, (we're way out on the long tail), we don't perform so well. We tanked in April. This is, obviously, Not So Good News. I realize this is not an uncommon refrain. We're not complaining. We think Google treats us reasonably fairly. We understand they constantly (if not secretively) tweak search results; We get the "Google Dance." None the less, this exposes our dependency on the G. We're digging in to figure out what happened and what we can do; Any suggestions?